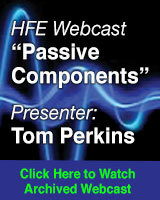 At higher frequencies it is practical to make inductors and transformers using tracks within a printed circuit board without need for ferrites or any other high permeability material. The largest difficulty with these inductors is to knowaccurately the electrical properties of these designs; however tools such as HFSS have eased this challenge.While EM simulators can provide extremely accurate predictions of circuit behaviour, the results are usually in the form of s-parameters which are not easy to equate to design parameters. 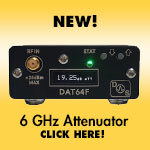 However extracting the required information can be simplified and automated using a circuit simulator like ADS or Microwave Office. Transformers are very flexible components in filter design as they provide two coupled inductors that can form the basis of two poles in a band-pass filter. Both the primary and secondary inductances as well as the coupling between them need to be well defined, and although quite good closed-form equations for planar inductors exist , estimating coupling isn’t so easy. The end result is that the designer needs to iterate a layout to get the desired result, and it is beneficial if design parameters can be extracted from the EM simulator to guide the direction of these changes. Fortunately the analysis is quite straightforward, and can even be automated. Figure 1 • An ideal transformer, and the equivalent circuit used in this article. The ideal transformer is completely described by three terms, primary and secondary inductance, and coupling between them. A real transformer adds capacitance within and between each inductance, and a resistance that limits the Q of each inductance . If we treat an s-parameter description of a transformer as a ‘black box’ we can define tests that permit us to assign values to these terms, and in doing so create a lumped equivalent circuit of the transformer. The terms can be calculated in sequence to construct the equivalent circuit in the following way. The same procedure can be repeated with the secondary to find Ls and Cs. A transformer with a coupling factor of less than unity is usually modelled as a T-network (figure 2), , where the inductor values are functions of primary, secondary and mutual inductance. Leaving the unmeasured winding open-circuit in the previous test ensures that the measured inductance is that of the winding, without influence from either the mutual inductance or the other winding. Conversely, shorting the unmeasured winding (figure 3) modifies the measured inductance in proportion to the coupling between windings. Figure 2 • Leakage-inductance model of a transformer. By measuring the resonant frequency of the primary when loaded with capacitance C1+Cp, Lx can be calculated, and M can be found. 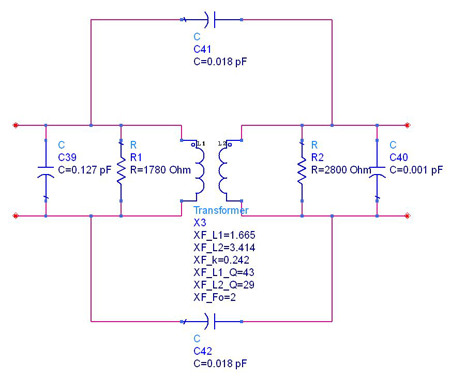 The accuracy of this calculation can be verified by repeating the calculation with the transformer reversed (shorting the primary, measuring the secondary) as the result should be the same. Figure 3 • Equivalent circuit of the shorted transformer with resonating capacitor test-circuit. This is the most difficult parameter to derive, however s-parameter simulations (or measurements) do provide enough information to find this. Figure 4 • Inter-winding capacitance model. The inter-winding capacitance produces a transmission-zero when it resonates with L1, L2 and L3. 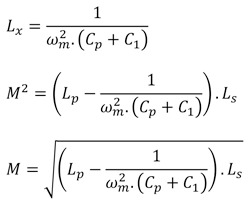 L1 and L3 form a potential divider that reduces the current into L2, and this must be considered when calculating C21. 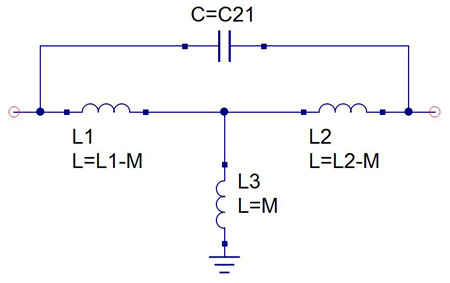 The equivalent inductance (Lpar) in parallel with C21 is L2 in series with the parallel combination of L1 and L3. Where ωω0 is the frequency of the transmission zero. As the capacitance is an ideal one in the simulator, the impedance (and therefore Q) is defined by the inductor. All of the analysis presented here can be based on eight individual ADS simulations, four for the primary and four for the secondary. The four simulations are further divided into two with the second winding open and two with it shorted, and for both conditions with and without a loading capacitor. This is shown in figure 5. 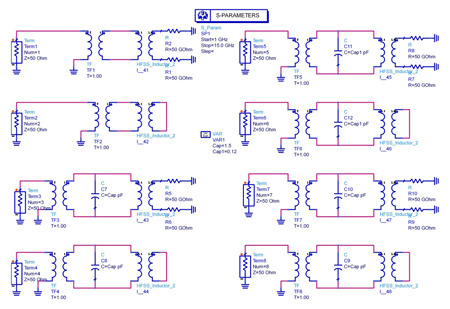 Figure 5 • ADS testbench for all the open- and short-circuit transformer tests. The actual processing to produce the required data is done in the results viewer in two steps – the first extracts frequency information from the simulations, and the second solves the equations shown earlier. The resonant frequencies are found using a simple command in a non-obvious manner; the reactance of a parallel resonant network passes from inductive, through resistive (at resonance) to capacitive as the frequency is swept from low to high. 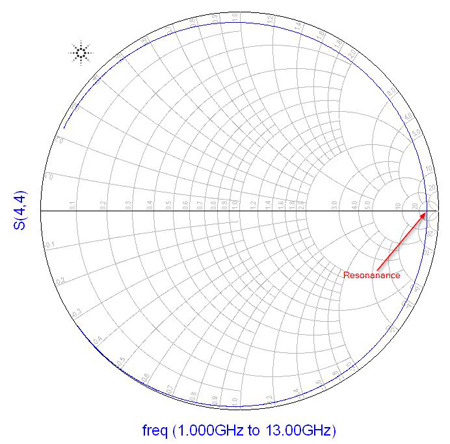 The resonance is therefore at the frequency where the trace crosses the horizontal axis on a Smith chart, as shown below. This can be extracted by first creating an array of phase and frequency from the reactance measurement, then finding the frequency that the phase changes sign. Figure 6 • Resonance occurs when the reactance is zero. In ADS the array of phase information can be created with the equation phase_array=phase(S(m,m)) and the frequency extracted with the equation resonant_frequency=cross(phase_array,-1), where m is the number of the port used for the specific measurement. 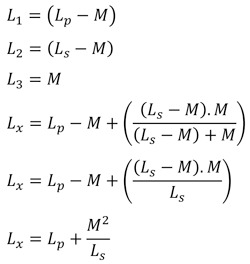 Using these equations and the relationships defined earlier the primary and secondary inductances and capacitances can be calculated. The inter-winding capacitance can be computed in a similar way, by measuring the frequency of the transmission zero when the transformer is placed between two ports as seen in figure 7, below. Figure 7 • Inter-winding capacitance test circuit. Where mm is the port number for this particular test. Figure 8 • Transformer layout in HFSS (outer primary, inner secondary) . At this point all the parameters for a simple transformer model have been computed, and a lumped equivalent circuit can be used in further circuit design or transformer layout. Figure 9 • Prototype filter design. The transformer design that was simulated was intended for a silicon IPD process that offers low loss in the substrate and small vias to give maximum layout flexibility. 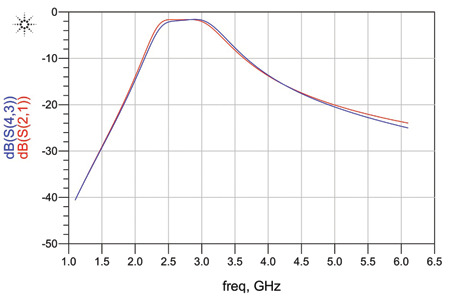 Figure 10 • Frequency response of the prototype filter with an ideal (red) and measured transformer (blue). 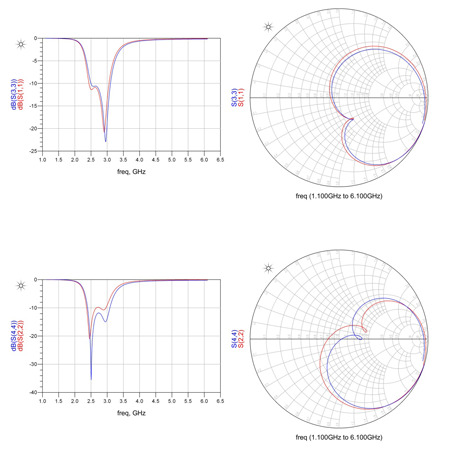 An ideal filter designed to meet this specification is shown in figure 9, and the frequency response in figure 10. The transformer that was designed for this filter was simulated in HFSS and, when substituted in the circuit the response plotted in blue is obtained. Analysing the transformer to find which characteristics account for the difference in response would be difficult with s-parameters alone, but by fitting an equivalent circuit to the response this insight is revealed.The equivalent circuit produced from the analysis presented here shown in figure 11. Figure 11 • Equivalent circuit of the transformer in figure 8. Comparing the filter response with the s-parameter file and the equivalent circuit is the final test for the analysis, and the correlation between the two is remarkable for such a simple equivalent circuit. Should even better alignment be required the model would provide a good ‘seed’ for the optimiser within ADS. Looking at the layout of the transformer it is clear that the tracks to the secondary are too long to be ignored, and this extra inductance certainly does modify the calculated equivalent inductance. 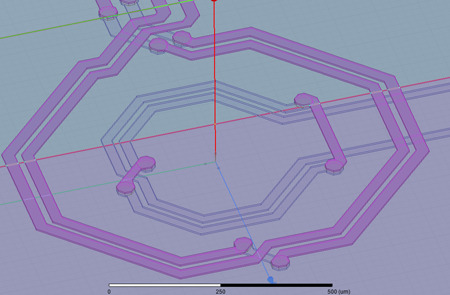 To improve the equivalent circuit in this instance, the designer could move the ports in the layout closer to the secondary or a series inductance could be added to the model. Fortunately the model presented here makes customisation quite simple; however the results are sufficiently accurate to make this unnecessary in most cases. Figure 12 • s-parameter (blue) and equivalent circuit (red) s11 simulations of the filter in figure 9. Figure 13 • s-parameter (blue) and equivalent circuit (red) s22 simulations of the filter in figure 9. 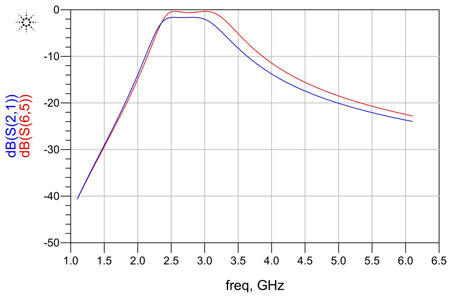 Figure 14 • Frequency response of the filter in figure 9 for s-parameter (red) and equivalent circuit (blue) instances of the design. A method of fitting an equivalent circuit to an s-parameter representation of a transformer has been presented. Associating values to the parasitic components of the transformer enables several design choices; the surrounding components may be modified to centre a design, and deficiencies can be attributed to specific transformer parameters. With this information the design of a transformer can be modified without ‘guess work’ to achieve specified performance metrics. Philip Macphail received his B.Eng. in Electrical and Electronic Engineering from the University of Birmingham in 1990. He has over 20 years’ experience in RF and analogue design, both with design consultancies and semiconductor companies, and also founded two companies along the way. Philip can be reached by mail at: Philip.macphail@huawei.com. Brian C. Wadell, “Transmission Line Design Handbook”, Artech House 1991. pp 391-405. 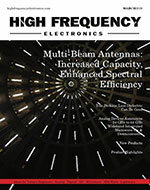 Mihai Albulet, “RF Power Amplifiers”, Noble Publishing 2001. pp 84-86.